"In this series each inset cartouche shows a scene from one of the eleven acts of he drama Chūshingura (Treasury of the Loyal Retainers), and this is likened in the main part of the design to a genre scene which shares elements in common. 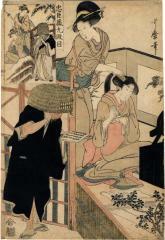 They could be considered as a variation of the idea of 'sibling pictures' (e-kyōdai...). All eleven designs are known." Quoted from: The Passionate Art of Kitagawa Utamaro by Shugō Asano and Timothy Clark, text volume, p. 225. Chūshingura Act IX - the scenes depicted here are when Tonase is about to kill Konami with the treasure sword of the Kakogawa clan, the plaintive melody of a bamboo shakuhachi flute is heard outside. The player is a travelling komusô priest. Such a sound means that he wants to get some money or food. Then Oishi's voice is heard ordering to stop. Tonase thinks Oishi stopped the priest playing shakuhachi, and she tries to kill Konami again. Oishi herself comes to the room, and she says she has changed her mind. Tonase has managed to save Konami's life. (Kabuki21). The traditional scene is portrayed in the upper left inset of the print. In the main image, a comb rather than a sword is used and the komusō reads from a book.